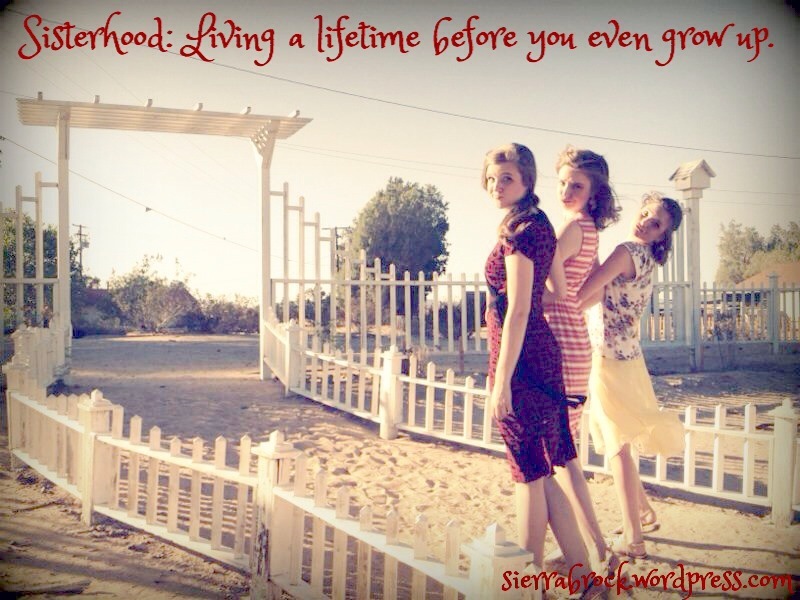 One of the worst things about growing up….. I know I’ve been out of the house for over 2 years, but sleeping in that room without my sisters is still one of the saddest parts of growing up. I have loved growing up. I don’t dread it like many of the people my age, but this one factor of leaving your sisters behind is bittersweet. Bitter, because you are leaving a childhood of memories locked away in a room completely safe from any secret thieves. Sweet, because all of you are pursuing the dreams that have been talked about for years and years. Music. Writing. Piano. Painting. Drawing. Fairytale spinning. We are weaving a different cloth…especially now since the room will officially be vacant since Cheyenne is leaving for Piano Prep School in late December. I thought it fitting to finally knit these words together. Calenders marked up with sorrows, joys, heartbreaks, and butterflies. Pictures scrawled from late-night ventures of laughter and smiling. Secret love scratched into paper hidden beneath our mattresses so that no one would find out. Bookmarks made for each other with the initials of those boys we just “loved”. Lists equal to New Years Eve Resolutions proclaiming how we were going to get good exercise, good sleep, good use of time……you know, those kind of lists. Stuffing our faces with vanilla ice-cream after a hearty soccer game. Talking until 1 am unraveling everything that went wrong and how it could all be made right. Constructing a secret recipe and then hiding that recipe somewhere safe in our room. Going to sleep at Christmastime and then our little brother dragging us all out of bed because we had to open our stockings together. I miss those trails down the hall. The dragging of our blankets…our favorite stuffed animals. Sleepy eyes. Messy hair. Comfortable. And we’ve moved from those days. It’s the first Christmas that all 3 of us will be in a different place. So, I just wanted to say a thank you to my two best girlfriends. Thank you…both of you…for keeping my secrets. Thank you for the laughter. And those silly inside jokes. Thank you for the moments that will never leave the room. For the wax still sunk in the carpet somewhere. Thank you for the comic relief after a really hard day. Thank you for teaching me how to dream. For forcing me to write. For letting me scrawl words on paper late into the night. Thank you for helping me stand up for myself. Thank you for those walls that we built around each other. Thank you really isn’t enough. And all three of us know it. I couldn’t imagine life without you both. But then we’ve talked about that before. Merry Christmas is different now, but then those memories that we’ve stored away in that room of ours will never go away. And that haven of sisterhood is still wrapped in precious moments and memories to come. Love it! Merry Christmas to you too! This brought tears to my eyes as it reminds me of growing up with my sister. Merry Christmas! Sisterhood is the best! I’m so glad that you had a sisterhood like mine. It’s truly valuable & words do not express the depth of the bond!